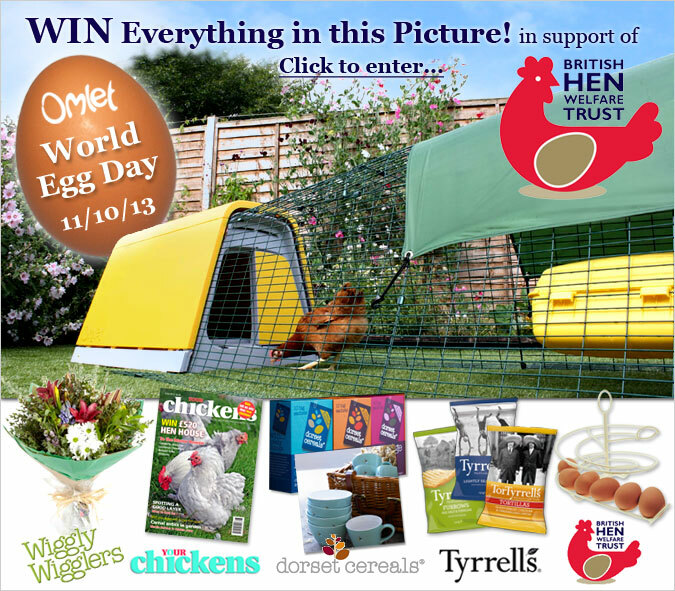 Enter our Competition and Help a Hen this World Egg Day! To celebrate World Egg Day we are giving one lucky person the chance to win a mEGGa prize. What’s more, for every entry Omlet will donate 10p to the fabulous British Hen Welfare Trust, the UK’s leading national hen welfare charity. So tell everyone you know to enter so we can build up a nice nest egg for the BHWT! We think eggs are brilliant. Tasty, nutritious and versatile, they are great to have in the kitchen, ready to rustle up something delicious in an instant. But, wouldn’t it be wonderful if you didn’t have to pop to the local shop for your eggs? If you win this competition the furthest you will have to go is the back garden because we are giving you the chance to win an Eglu Go, worth £360, so that you can start keeping your own chickens. You’ll want somewhere to store those tasty eggs, which is why our friends at the British Hen Welfare Trust will be sending the winner an Egg Skelter, to keep them in date order. And what better way to eat those lovely eggs than with a stylish set of crockery from Dorset Cereals!? They’ll be sending you their entire range of new porridge too so you can really breakfast like a king. You’ll also receive a subscription to Your Chickens Magazine, so you can read up on your new hen-keeping hobby every month. There’s one more treat lined up for the lucky winner too – a beautiful British bouquet from Wiggly Wigglers. Just because you deserve it! So, what are you waiting for? Answer one simple question for your chance to win. But be quick, because the competition closes at 11:59pm tonight. Place an order today and we will send you a Free Bouncy Egg, to celebrate World Egg Day. Just use promo code: WORLDEGGDAY to get your freebie. But be quick, because this offer will expire at 11:59pm tonight. Offer valid on UK orders only.